Welcome to Penang Island - The "Pearl of the Orient". 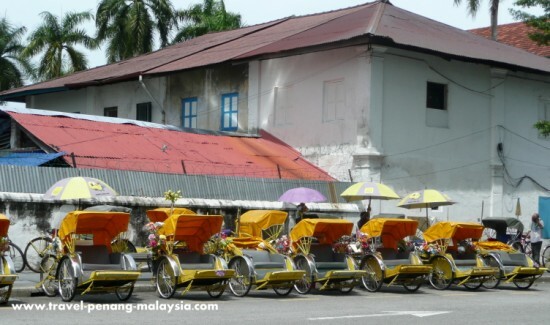 One of Malaysia's top tourist destinations, Pulau Pinang as it is known as in Malay, has everything for a visitor. Historical sights, temples of ever faith, beautiful beaches, great shopping, fantastic food and even a National Park for a spot of jungle trekking. The island is easily accessible by a short 15 minutes ferry ride from the mainland at Butterworth or by driving over the 13.5 km bridge that links to the mainland (with a new even longer 24 km bridge now open). The most popular place to travel to Penang from is Kuala Lumpur, 360 km to the south and now linked by the new ETS high-speed trains. The old colonial capital, George Town, is like a living museum with its varied styles of old Chinese shop-houses, built around the grand old British colonial buildings. I never get bored with walking around the old streets. Now a UNESCO World Heritage site, many of the old derelict buildings are being restored to their former grandeur, so offering even more places to visit. It's one of only a few places left in Asia that you can still see such sights these days, due to far too rapid development in other cities in this region. Take a look at our photo gallery to see the many sights of the island. Along the island's Northern coastline, Batu Ferringhi beach offers a long stretch of sandy shoreline and all you would expect from a popular beach destination. There are also plenty of more peaceful stretches of sand dotted around the island for those seeking a little peace and quiet. Where are the best beaches in Penang? Well, they are hidden away in the National Park, where you will have to trek in or hire one of the local boatmen to take you there. You will find all types of accommodation available for your stay on the Island, from budget backpackers hostels, to top luxury resorts in historical heritage buildings in George Town. For those who prefer to be by the seaside, there is a good choice of beachfront hotels in the popular resorts towns of Batu Ferringhi and Tanjung Bungah and like most things in Malaysia, you get really good value for your money. See our latest section on new hotels and resorts around SE Asia. See our special sections on Malaysia Trains.